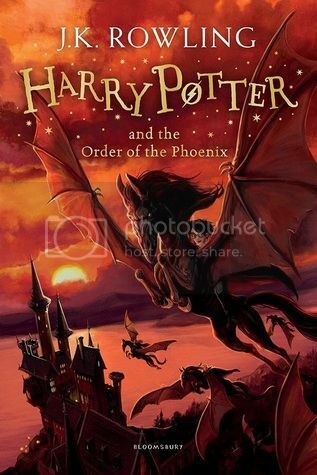 Harry Potter and the Order of the Phoenix by J.K. Rowling - Harry Potter is furious that he is stuck at the Dursleys’ house for the summer, when he suspects that Voldemort is gathering an army, and the wizarding authorities seem unwilling to do anything. Harry’s so-called friends are trying to keep him in the dark. But he knows that Voldemort’s forces can find him wherever he is; he could be attacked at any moment. Harry is finally rescued from Privet Drive by members of the Order of the Phoenix – a secret society first formed years ago to fight Voldemort – and discovers that maybe he is not alone in this battle after all. From Goodreads. Re-reading Order of the Phoenix is always causes such mixed feelings in me. I love the book, my mixed feelings aren't there, but I do despise Umbridge with such a passion, I spend a lot of the time feeling angry. And yet, I absolutely love everything that happens at the Ministry, and discovering the prophecy. I actually really enjoy how angry Harry is in this book. He's left in the dark for so long at the very beginning; he has no idea what Voldemort is up to, if he's safe, and he gets nothing from Ron and Hermione. But also, he's been through so much in his life so far, and not that long ago he saw Cedric die right in front of him, and saw Voldemort come back; that's a hell of a lot to deal with. It makes sense to me that dealing with it all would affect him in some way, and it's resulted in a lot of anger. The anger comes in useful, of course, when it comes to standing up to Umbridge. Oh my god, that woman is foul. I have this very strong image of her in my head, and it just makes my skin crawl. The pleasure she gains from torturing children is sickening, and I just can't deal with her. She's almost on par with Voldemort to me. I'm really not a big fan of Snape at all for the first six books of the series (even knowing what's revealed in Deathly Hallows), but I prefer him to Umbridge. Umbridge makes my blood boil. But ooh, all that happens at the ministry! One of the main reasons I signed up to Pottermore when it first started was to find out more about the Department of Mysteries! Though I never found out. I am so intrigued by what is being studied down there! I so want to know more, though I did work out what subjects are being studied this time round; time, thought, death, and as Dumbledore revealed, love. But I want to know more about those studies specifically! Why are their brains in a vat of green liquid? What exactly is behind the veil, and what would happen if you went through it? Could you get back? What's with the bell jar that goes back and forward in time? And what exactly is kept in the locked room of love? I so desperately want to know! I doubt I'll ever get my answers, though. And the prophecy. I remember the "Woah!" I felt the first time I read Order of the Phoenix and discovering that either Harry or Voldemort would do the other in. Previously, I thought Voldemort kept going after Harry because he survived and brought about his downfall when Voldemort tried to kill him as a baby, but to discover that it was also because of the prophecy... and that Harry learns he will have to face Voldemort in a duel at some point, that was shocking. This time, I paid much more attention to how Harry reacted. He's only 15 at this point. I think his age never really hit me when I was reading the books the first time round, because I was a similar age, and it never really mattered to me during my other re-reads, but I've been very much aware of how young Harry is. And to discover at 15 that you have to try and kill the most dangerous dark wizard of all time... that's so much to take in. The thing is, we all know when we read these books the first time round that the two would come face to face in a big show down at some point, because that's what the series is leading to, but forget Harry is a fictional character for a second: he's a boy who's just discovered that he has to kill or be killed by Voldemort, who has never really given him a moment's peace since he discovered the wizarding world. There's suddenly no doubt about it for him; he will face Voldemort; he will kill or be killed. (Or at least it seems at this point; Dumbledore shines some more light on the prophecy in the next book.) That's bloody huge. And my heart just went out to Harry, because who could see past such an event? That's all there is to his future at this point, that's all he can see. God, I am absolutely loving this re-read of the series! I really am getting so much more out of these books than I have before! I love that you're discovering so many new things about the series and enjoying the re-read just as much as the original read (if not more! ).